Wintertime visits to a remote Alaskan Wilderness Lodge! In the winter months, Sadie Cove is offering exclusive use of the lodge for private groups of up to 8 guests. For those who are adventurous enough to discover Alaska’s "other" season, this can really be the adventure of a lifetime. It is a time of year when we locals experience the beauty of snow and ice in a way most people can only dream of. The ultimate luxury of privacy, and solitude become yours for a few days in a setting as beautiful as one could hope for. Alaska is at her best in the winter – Imagine the joy of playing in the snow (perhaps building a snowman as a family event) or watching and photographing the abundance of sea life which takes to the cove for the winter. In camp, there are hot steamy saunas lightly scented by eucalyptus and the native hand-hewn logs used to build the structure. (Followed by a dive in the snow if you like.) 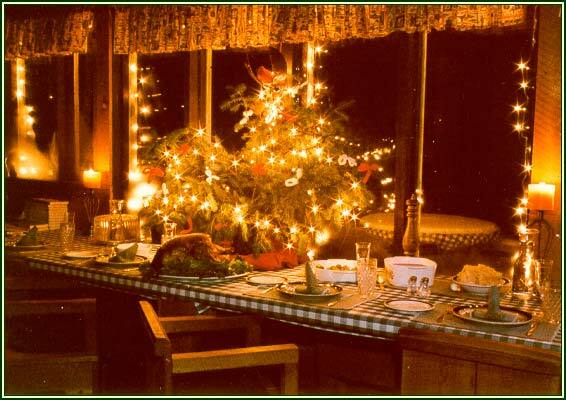 Then, a family style meal in the dining hall all lit up by candles that would make even the toughest of Vikings very happy. After dinner, hot chocolate or mulled cider in the Norseman Hall while telling stories of the days adventures beside a crackling fire. 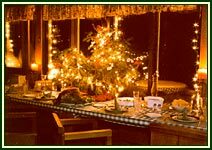 Christmas, New Year, and Thanksgiving would be available as well to share this unique and rewarding wilderness experience with family and friends. Rates are $600 per person per night plus gratuity, transportation, and local tax payable by check or wire transfer. In the winter, we reserve the entire lodge for private groups only with a minimum of 6 guests and a maximum of 8 guests. A minimum of 4 nights is required and prices are all-inclusive as they are in the summer months. Once at the lodge, there are no additional costs. Transportation to and from the lodge is by water taxi or helicopter depending on the conditions on the bay.